located on the corner of 10 Mile Rd. and Dequindre Rd. 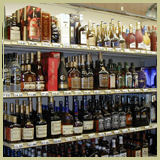 We offer a wide selection of fine wines, liquor, and beer at the best prices. 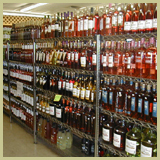 Mona Lisa Liquor Shoppe is a family owned and operated business that offers a wide selection of beer, wine, and liquor at great prices. In fact, we have the largest selection in town! Our knowledgeable staff will offer expert advice to help you choose from our extensive selection. We also provide keg beer and deli party trays. Mona Lisa Liquor Shoppe is the only local store that offers sport books for football, basketball, baseball, and hockey. Horse racing forms, programs, and lottery tickets are also available. Click on a photo of the store above to see a larger view.